Fall is a magical time of transformation as mornings turn crisp and the brilliant leaves flutter down to find their way to the…street? In natural landscapes, leaves blanket the forest floor and eventually become rich soil. But as we have interrupted the natural cycle with our homes and other “people spaces,” much of the land is covered by impervious surfaces like streets, parking lots and roofs. And instead of water and nutrients making their way in to the soil, storm drains provide an expedient and direct route for pollutants - in this case leaves - on streets to flow into our waters. How could leaves be considered a pollutant? After all, they are natural! Although leaves have valuable nutrients that can be turned into rich compost and be reused by plants, these nutrients are not natural to lakes and create excess algae. One pound of phosphorous contained in organic matter such as leaves creates about five hundred pounds of algae. Raking up leaves and grass clippings is critical to keeping our lakes swimmable and fishable for us to enjoy. Although cities sweep the streets, cities can’t possibly time it perfectly to capture all of the leaves. The help of local residents is important. Some citizens have started “Community Clean Up” events, days where residents get together to rake and bag leaves off the street. There are free toolkits available for hosting such events through the Freshwater Society. Visit http://freshwater.org/community-clean-ups-for-water-quality/ to get started with a small chore that can make a big impact. This fall, residents are encouraged to do their parts and rake up and compost leaves. Jumping in them beforehand is encouraged—followed by a nice cup of cider. Since most land in Minnesota (about 78%) is privately owned, the way individuals manage their own resources makes all the difference on our collective public resources. What’s the big deal about buffers? A buffer is vegetated land adjacent to a stream, river, lake or wetland and they can do a lot of good! Buffers help slow the flow of water across the land and they filter out phosphorous, nitrogen, and sediment - all pollutants that degrade the quality of our lakes and streams. Buffers also help stabilize lake shores and streambanks against erosion, which also improves water quality and protects important shoreland habitats. For these reasons, the State of Minnesota recently began a new “Buffer Initiative” that will soon require public waters in the state - lakes, rivers and streams - to be surrounded by vegetated buffers 50-feet wide (on average) and public ditches to have 16.5-foot wide buffers. While buffers of native plants are best, any vegetation (including turf grass) is allowed in this new rule. Buffers will need to be installed on public waters by November 2017 and on public drainage systems by November 2018. In all, the new initiative will result in about 110,000 acres of buffers along Minnesota waterways. The Minnesota Department of Natural Resources recently released buffer maps that show which waters are subject to the new requirements. Landowners can use these maps to determine if buffers are needed on their property. Most of the new buffers will be established in rural areas rather than within cities. And, the new rules will not impact lakeshore residents who have beaches, docks or landscaping - although those properties must comply with existing DNR, county and watershed district rules. The Hennepin County Environment and Energy Department will be contacting landowners who may be affected by this new law in the fall of 2016. Learn more about the buffer initiative. Winter rye provide low-cost, high quality feed and allows the farmers to plant three crops in two years. On a warm day in August, the Patnode Family Dairy Farm in Corcoran was the center of attention. The farm hosted an event highlighting the results of their Minnesota Department of Agriculture Sustainable Agriculture Demonstration Grant project, “Three-Crops in Two Years for Farm Profit, Soil Health & Water Quality: Winter Rye after Corn Silage Managed for Forage”. This informal learning session gathered together farmers and scientists to consider soil quality, pollution prevention, and enhanced farm productivity. The event was sponsored by the MN Dept. of Agriculture, UM Extension-Hennepin County, the Sustainable Farming Association of MN, and AG Resource Consulting, Inc. of Albany, MN. Lunch was provided by the Corcoran Locker. This well-run family dairy farm in the Elm Creek Watershed includes 80 cows and 400 acres and is adding a new free stall for more capacity and a manure storage structure. Thirty attendees, including a majority of local farmers, learned about the successes and challenges of using cover crops for improved productivity, water holding capacity, and the benefits of keeping soil and nutrients on the field where they belong. Daryl, Lori and Andrew Patnode described their experiences growing, harvesting and feeding winter rye on their dairy farm and reported that they were pleased with the results, both the quality of the feed they produced, and how the system fit into their overall operation. They said the winter rye provided a good seedbed for this year’s soybean crop as well. As a cover crop the winter rye protected the soil during the fall, winter, and spring by keeping living roots in the soil and providing soil cover. 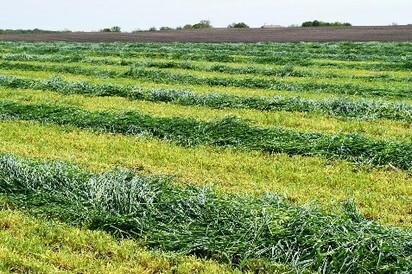 As silage, the rye produced a low-cost quality feed early in the spring. And, soil erosion and polluted runoff was minimal. “Soil Health and the Successes and Challenges of Cover Crops” was presented by Glen Borgerding CCA, and James Schroepfer, B.S. Agronomy, AG Resource Consulting, Inc. They emphasized the agronomic potential of keeping the soil covered and keeping living roots in the soil. Advances in our understanding of soil biology is opening up a whole new chapter in our management of agriculture soils in ways that can reduce the need to apply nutirents, improve productivity, and greatly improve infiltration and water holding capacity –the opposite of runoff! Jason Walker form the Sustainable Farming Association of MN described their many programs aimed at soil quality and how they are making a real impact across the state and nation. Jason shared the five soil health principles: keep the soil covered; minimize soil disturbance; increase crop diversity; keep living roots in the soil; and, integrate livestock. Alatheia Stenvik, MN Dept. of Ag. (MDA), highlighted the Sustainable Ag. Demonstration Grant program for farmers to try out new and innovative practices. See the “Greenbook” of this year’s and previous projects. Have you ever watched a large carp stir up the bottom of a lake or river? As they root around for aquatic plants to eat, they degrade water quality - especially in shallow lakes. Their activity can make the water turbid and releases phosphorus and other nutrients into the water, causing algae blooms and a cascade of other impacts. The Shingle Creek Watershed Management Commission recently received a$100,000 grant to study and manage the carp population in the three basins of Twin Lake - Upper, Middle, and Lower - and downstream in Ryan Lake in Brooklyn Center, Crystal, Robbinsdale, and Minneapolis. A large carp population is known to reside in these lakes and all four lakes were listed by the State as Impaired Waters for excess nutrients, although two have since been “delisted” based on improved water quality. Managing the carp population is an important component of improving and protecting water quality in the lake system. In late September 2016, up to 45 carp in the lake chain will be implanted with tiny radio transmitters. This will enable biologists to follow how they move around the lake system, and where they congregate. Mobile antennas will be used periodically to determine locations of the tagged fish, and a fixed antenna on land will track whether the fish are actually traveling out of the lake system. Once their overwintering locations are found, commercial fishermen can harvest the fish and bring the population down to a manageable level. The carp will be tracked through winter 2017-2018, and the potential fish harvest will take place in early 2018, before spawning season. Stay tuned to find out how many pounds of carp they harvest! See project updates. Friday October 14, 2016 from 8:30 a.m. to 12:30 p.m at the Science Museum of Minnesota, Saint Paul. Getting to Clean Water: How Do the Economics of Cropping Systems Measure Up? Ecosystem Services: Putting People and Land into Water Management Water: Right or Commodity? Learn more. To RSVP, and for more information, contact Lark Weller at 651-293-8442 or lark_weller@nps.gov. We’d love to keep you informed and connected to water and watershed news.